The Day of the Tiles (French: Journée des Tuiles) is an event that took place in the French town of Grenoble on June 7, 1788. It was among the first of the revolts which preceded the French Revolution, and is credited by some historians as being the start of it. The Estates General, which sparked the revolution with the Tennis Court Oath of June 1789, became the revolutionary National Assembly. The storming of the Bastille followed in July 14, 1789. Before that notable event, however, the riots of the revolution spilling into the streets of France began not in Paris but in the streets of Grenoble, the actual cradle of the revolution, with the Day of Tiles (June 10, 1788). The insurrection spread from there to the countryside with desultory grain riots, flaming more deliberately (from March through April of 1789) in the concerted defiance and in protest of the hated game laws protecting birds and animals for the hunting sport of the King and the nobility. 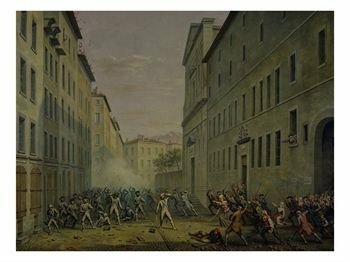 Thereafter, the mobs also learned to command the streets after the Réveillon Riots (April 1789) so that by mid-summer of 1789, they had had ample practice for the storming of the Bastille. Regardless of what the reader has been led to believe, the earliest revolutionaries were not bourgeoisie, but nobility and high clergy, many of them functionaries in the old regime, including some of the king's ministers and advisors. Intoxicated by idealism and Rousseau's sublime concepts of virtue, reason, equality, etc., they had set out to correct real or perceived iniquities in France. Louis XVI's loyal ministers saw the dangers lurking ahead, but seemed impotent to effectively protect the monarchy and solve the problems afflicting France, particularly the serious financial problem and the threat of national bankruptcy.